Big Ideas--in a small book! Motivational, sales principles with short explanations to inspire and guide salespeople throughout their careers. With our hectic lives, we don't have time to read 300-page, 100,000 word books! With this little book of Big Ideas, Carla's great sales principles re condensed so it's readable and memorable fast! Inside this 'little book': 80 to-the-point sales principles Carla Cross has learned, used, and taught over her three-decade sales/management career. This book also has explanations, to clarify why these sales principles are so important to success. Who is this book for? Anyone in sales! Managers/trainers/coaches: Give this book as a gift to your clients; use it to teach these principles. Buy 5 for $25 plus shipping. Recruit Winners with the Systems You Need! If you feel your recruiting (or lack of it) is holding you back, you need The Complete Recruiter. Refine your recruiting skills to recruit winners in this transitioning market. 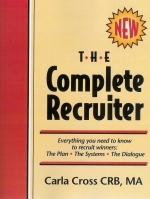 The Complete Recruiter takes you through the complete recruiting process--with dozens of ready to use recruiting letters, documents, and processes. Why not step up your recruiting to executive status? Create your Brand. Stand out from the Crowd. Gain Confidence. This is an Ebook resource and downloadable audios. Nothing is mailed to you.. You will receive information on how to download this eBook and the audios at the bottom of your order receipt. Download the program as you order and get the information immediately! (Downloads expire in 72 hours). How do you figure out how to stand out from the crowd?Marketing YOU will coach you to find your 'uniques'. If you're having confidence challenges in this market, you need this resource. It will build your self-confidence and help buyers and sellers choose you. A 'must' for newer agents; an invaluable tool for seasoned agents getting back into the game. Managers: Two training sessions included to help you help your agents gain the confidence to overcome that call reluctance. List More Properties With Confidence! Just updated with the latest National Association of Realtors survey results from buyers and sellers--so you can speak with credibility and evidence to get listings priced to sell. Take a look at a short video I just created to show you the program--and give you 4 critical tips to create a great presentation. This comprehensive resource is immediately downloadable (follow instructions at the bottom of your sales receipt). You'll get the complete training tutorial (101 pages)--great for managers to use for an exceptional listing training program, too. Plus-- 30 documents, forms, and checklists to use, ready to customize. You'll also receive the 2 PowerPoint presentations and the unique Topic Pages, to use to organize a hard copy presentation, if you prefer. Great agents have created systems, and here is your complete sellers’ system, from the first time you talk with them on the phone, to after that listing sells. You’ll impress even the toughest sellers as professional, organized, and knowledgeable. Never be stumped by an objection again! In just a few minutes, you can learn to handle and master the most common—and tough-- buyer and seller objections. Using our colorful flashcards, read specifically scripted effective answers. Learn how to craft your own ‘objection buster’ with an easy to grasp AAA method, designed by top producer and master trainer Carla Cross, CRB, MA. Gain verbal power and supreme confidence. On the accompanying audio CDs, hear answers to those objections--role played so you can listen in your car—anytime—and learn. Bonus: If you're a manager, you'll want to download the free class modules I've created to turn these resources into classes to help your agents. Be sure to download the class within 72 hours of placing your order. Enjoy! About this resource: Both the handbook and the audio CDs are digital. Nothing is mailed to you. Need to make a presentation for 2 or thousands? Want tips on how to structure your video presentation? Here are the tips the greatest pros in the world use to hold their audience’s attention, capture, and captivate. Whether you’re a seasoned presenter, or just thinking of doing your first presentation, you’ll grab dozens of speaking strategies. Where: Keller Williams Realty, Bellevue--all are invited! Is the class you’re teaching (or supposed to teach) full of facts and figures? And, there’s no instructor manual or guidance in how to teach it? Are you finding yourself talking through it—talking for hours? 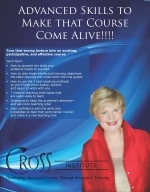 (Even boring yourself…) Are you struggling to make that course come alive? If you want to energize your course, keep your audience interested, and change their outcomes for the better, you need this unique course! Bottom line: You’ll walk out of this course with the skills to take any boring class and make it highly participative, useful, and fun to teach. You’ll get the 3 best methods to use, how to use them, and when to use them to ‘plug them into’ any course at the right time. You’ll even have time to try out your new methods and get feedback—and watch others, too. Why not energize your course, have a better time teaching, and gain business all at the same time? No other resource like this! If you want to create a course, you need this resource. Step by step, Carla Cross, who has written courses for Re/Max, Better Homes and Gardens, Keller Williams Realty, GMAC, Royal LePage, and CRB, shows you exactly how to create your course and your outline. And, for those Washington state instructors, she shares tips on how to get your course approved for clock hours. This resource works for anyone writing a course in any subject! My references are to real estate, but all good courses should follow these writing principles. This resource is digital. You will get access immediately. (Great for international clients!) Be sure to download the videos and the resource guide right away. Directions are at the bottom of your order receipt. Bonus when you order: Keys to a Killer Introduction (eBook) . Guidance in how to get your course approved in Washington state. 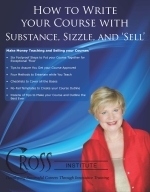 With 95 pages, this resource, along with the 2 instructional videos, shows you exactly how to create a course that has substance, sizzle, and 'sell'! See a sneak preview here. This is a wonderful resource for Education Directors who want to help their instructors create exceptional courses. Thank you for a wonderful class on writing a course. This practice and hands on class has given me the confidence and tools I need to move forward with my course curriculum. I feel I have been given a business race car and I can move forward towards my dream of training agents across the country. Mary Lee, former head of training for Windermere Real Estate, Spokane, Wa. Get more Buyers to 'Yes'! Updated! Now, all documents and audios are online for your immediate downloading! All documents are in Word or PowerPoint so you can customize them, except for the instructional outline (99 pages). Want audios online? They're here! So, you can download all the documents AND the audios and get immediate access. Agents who win with buyers consistently have perfected their ‘buyer system’ just like their ‘seller system’. Now, you can, too. Here are all the forms, systems, and processes you need to make more sales in a challenging market! Plus, master coach walks you through every step of the process working with buyers. Much more than just forms and lists, this resource is a complete tutorial from master coach/trainer Carla Cross. Buyers expect much more today from real estate agents, yet most agents haven’t ‘re-tooled’ or systematized their buyer processes to deliver that “value-added” service that buyers demand. Managers: Use this comprehensive buyer toolkit to train and coach your agents to work with buyers professionally. The Complete Buyer Agents tool kit is perfect! I was able to use it with ease right away. The checklists and especially "Your guide to purchasing a Home" were very impactful on a new buyer I recently met. I am so glad I invested in this invaluable resource. Xavier Bryan, Newport News, VA.
Purchase the complete business planning system for 1/2 price this month! Are you falling behind because you don't have a plan? Here it is, with all the guidance and planning pages you need. A complete real estate business planning system with all planning pages on a ‘document CD—for the experienced agent. Information, too for agents with teams. This is not just a generic business plan! It’s written expressly for real estate sales professionals. Leave your career behind and start running a business--with your own customized business plan. Managers: This is an exceptional training tool to guide your agents through the planning process. Note to new agents: Your planning system is Up and Running in 30 Days. This is a digital program--nothing is shipped to you. You get access to all materials and webinars as soon as you are approved for membership (usually within 1 day of ordering the program). Important: You won't get your materials on this site. After you order the program, you will get an email that directs you to the business planning membership site. Watch for that email. You will register. We will approve your registration via email within 24 hours of your registration. Then, you can go to the membership site and get all your information. If you’re in sales, you know you need a business plan. But, if you’re feeling frustrated with the type of planning you’ve done in the past, if your plan hasn’t been a real guide, you’re ready for something different. Create a plan that’s different, that’s usable, and that’s inspiring. And, do it FAST! Use Carla’s unique planning process to pinpoint where you’ve been wasting your time and money, and get dozens of tips to fix both. Gain dozens of tips to go from ‘career’ to ‘business’. Great for teams, too! (a special bonus included in this package to show you how to use the planning process with your team). Carla Cross’s business planning system works. Following her concepts, I earned almost 6 figures in my first year as an agent. Her system has been an integral part of my business success ever since. Don’t let another year go by without a professional plan. 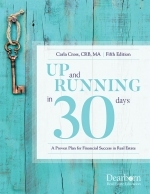 Step up to Carla Cross’s strategic planning system and go from ‘career’ to business. Now: Instant digital delivery! All your course materials, including audio links to the 'CDs' (no hard copies) and videos, are now downloadable, so you can start your course right now! This course fulfills the requirements to become a clock-hour approved instructor in Washington state. It has the same curriculum as my 'live' course', Instructor Development Workshop. About this resource: The handbook and other documents are digital. After you order the program, you will receive instructions in your order confirmation on how to download this resource (documents AND the audios). Be sure to download right away. Your pass code will expire in 14 days. If you're ordering for someone else: Please email Carla the person's name, phone, email, and address so Carla can update the shopping cart and her records so that person taking the course gets all the information and certificate. Learn at your own speed. Get the latest facilitation tips from the master herself, Carla Cross (a national Realtor Educator of the Year and Washington Realtor Educator of the Year). By the way, this is the only distance learning Train the Trainer course endorsed and recommended by the Washington Association of Realtors. Note: You have 14 days to download this course after you order. You have 6 months from your date of purchase to finish the course. After that, renewal rates apply. Online: Now, you can complete your course online. You'll receive the 140+ page course through downloading (directions come with your order confirmation). You'll receive the Course Guide, which steps you through the course. You'll also receive the forms you need to take the test, your monitor log, and your Evaluation of the course. 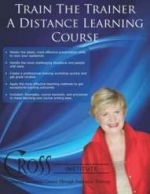 You will complete these, save them, and email them back to info@carlacross.com to show you completed the course. This 140+-page outline is truly a trainer’s goldmine resource, fully updated and expanded. It will be a resource for your teaching forever. Showing 21 results, with 25 results per page.